Het complex bevindt zich in gebouw 10, direct tegenover Kamaole 3 Beach, een van de belangrijkste stranden van Maui, met zwemmen en snorkelen voor de deur. U kunt op de veranda zitten en kijken naar de in de oceaan zon, of walvissen kijken november tot en met maart. Het complex ligt rond een centrale aangelegde gebied dat fonteinen, een groot zwembad, 2 hot tubs, aan het zwembad fitnessruimte, activiteitencentrum en tennisbanen bevat. U bent op loopafstand van winkelen en lekker eten, en een korte afstand tot de Wailea golfbanen en winkels van Wailea. Dit toestel heeft een zeer goed gevulde volledige keuken, of u kunt ervoor kiezen om te koken op een van de acht dubbele gas barbecue centra op het terrein. De flat is volledig self-contained, en is geheel gerenoveerd. Het is een uitstekende locatie voor een familie vakantie of een romantisch uitje. Absolutely loved this condo. It is beautiful and perfectly decorated. The property is very close to the beach and the owner was great to deal with! Would definitely stay here again!! Thank you for taking the time to write a review. I am glad you enjoyed your stay. Your booking was greatly appreciated. This updated condo has an excellent location - easy walking distance to shopping, restaurants and the beach. Enjoyed preparing meals in the well equipped kitchen. The furniture, bed and decor provided comfortable surroundings to relax in. Excellent views of the beach from the lanai where we spent most early evenings and a wonderful hot tub on site to unwind in after a day of golf. We would definitely book this condo again and thank you Gabe for the welcome gift. Great Unit! Great Views! Great Location! I recently stayed in unit 10-203. It was fantastic. The pictures do not do it justice. The unit is well equipped for all dinning and cooking needs. It also has equipment for the beach like chairs, umbrella and cooler. For those, like me, that are hot sleepers, the air conditioning in the bed room kept me cool enough to sleep. The unit is directly across the street from the beach. The beach has two very active turtles. Take your snorkel gear and have fun. Word of caution on the pool. They are very strict. No music, no bottles and apparently no loud talking/laughing. We were told to be quiet, yet the numerous kids that were screaming were fine. This is a great unit and a great complex. It's close to shopping and dining. You must go to Cafe Kihei for breakfast. You won't regret it. I absolutely loved our time at Kamaole Sands and am looking forward to going back. Thank you for taking the time to write a review. I greatly appreciate it. Have been in Kihei at this complex and others along the strip. Found this condo to be top tier - lovely, modern and clean. It has an extremely well equipped kitchen including sharp knives and spices. Beach towels, chairs and umbrella are much appreciated bonus. Gabe is very helpful and even gave us a lovely goodie bag. Mahalo! I would like to thank you very much for taking the time to write a review. Is much appreciated. Gabe’s place is welcoming and comfortable from the moment you arrive. You feel like you’ve come home for a visit. Exceptionally well equipped - you want for nothing. Clean and fresh in every way. Gabe is readily available should you have any questions or concerns. Excellent location in Kihei - easily accessible to every wonderful thing Maui has to offer. A great choice - don’t miss out. Just one FYI there were 2 extra fees that had to be paid to the resort on arrival so just a caution when comparing costs with other properties. Otherwise all good. Thank you for taking the time to write a review, I greatly appreciate it. Beautiful condo, nicely decorated and comfortable! We loved eating on the large lanai, watching the ocean, and people playing in the surf! Sunsets are an event that isn't to be missed: wander over to the park across the street and enjoy the show! Gabe has provided all the amenities- beach chairs, towels and boogie boards, plus a well stocked kitchen. Mahalo for the goody bag and welcome note, too! We only used the AC on the first night, and the fans kept us plenty comfortable with the doors open. 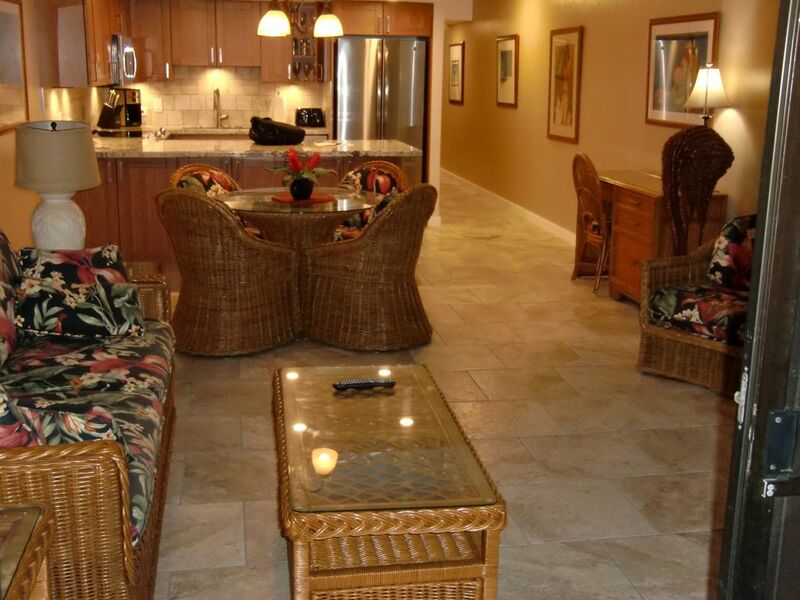 We recommend this unit for a lovely vacation in Maui, you'll be glad you came!! Aloha !! Thank you for taking the time to write your experience staying in our Condo, much appreciated.